Online gambling’s great isn’t it? Play what you want, when you want, wearing what you want (or not) without having to interact with pesky humans… ever. Surprisingly – considering my choice of industry – I’m not much of a gambler; I like playing games tremendously but get no thrill from winning or losing money. To me the wager is just a ‘fee’ I have to pay to get people to take playing games with me seriously. Luckily I tend to be quite good at games (I blame a combination of Granddad’s love of rummy and Super Street Fighter Turbo II) so it’s a pursuit that either costs me nothing or occasionally accidentally makes me a profit. Don’t worry, I’m not about to start a ‘JustGiving’ page or anything – it’s not like Vegas is about to close – but at the end of 2012 the Nevada Gaming Control Board reported an 11.1% drop in casino year-on-year figures (revenues of $782.6 million for November) while the Las Vegas Strip itself saw a drop of almost 13% to $431.9 million over the same period (perhaps it’s time to turn some of those lights off?) Strip table win was down 16% while the take from slot machines dropped 10.3%. And then flip a coin and there’s Macau: a special administrative region of China that relaxed monopoly control of its gaming industry in 2002 in a bid to generate economic growth via gambling tourism. And boy did the plan work! The gap between the two cities has since grown and grown, and in 2011 Macau’s casinos collected US$33.5 billion from gamblers. The total gaming win for Clark County, Nevada during the same period was US$4.5 billion. Indeed Macau looks destined to continue stretching its lead, as its gaming revenues rose by 13.5% in the first 10 months of 2012, while Clark County’s climbed by just 5.8%. While the trend can be partly explained by the differing fortunes of the Chinese and American economies in recent years, the main reason for it is the construction of a number of high-class casino resorts in Macau. The region now has 33 casinos, including some complexes that feature lavish hotels and spas. 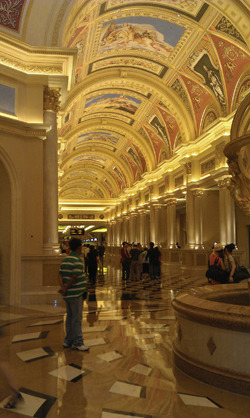 The Venetian Macau is the most extravagant, boasting 3,000 suites, a 15,000-seat arena, theatres, restaurants, duty-free shopping, four pools and a gym (but no cowboy signs with slowly-moving neon thumbs – tsch!) When guests remember it is primarily a casino, they can choose from 800 tables and more than 3,000 slots. MGM Resorts International also recently won approval for its new Macau casino-resort, announcing plans to build a $2.5 billion five-star resort in the Cotai district, complete with 1,600 rooms, 500 gambling tables and 2,500 slot machines. Though it’s very easy to understand why Macau has become so popular so quickly, ol’ Sin City remains a great destination for more gambling-focused visitor. The Strip has 38 casinos, and the number of resorts means hotel rooms are relatively cheap with a huge selection of restaurants to choose from. Entertainment is still strong in Vegas, with Cirque du Soleil and Elton John still dusting off their wigs and g-strings (you work out which goes with which!) each and every night. I have no idea why I’ve turned this into some defence for Las Vegas (I do hope you don’t get the impression I make these columns up as I go along!) but I think it’s easy to be dazzled by the current ‘big thing’ without remembering that Las Vegas is an incredibly important part of our gambling heritage, and every roll of the virtual dice we execute, or smiling live dealer we flirt with on our iPads owes some small debt to a location that, while possibly no longer king of the hill, will always be there in the background, just asking for the occasional tip of your Stetson or 25c of your time.